Since this past April, I've been busy sewing garments for my daughters, various tops, skirts & sundry items. The pièce de rèsistance has been the ballgown for my middle DD, inspired by Belle's gown from Disney's "Beauty and the Beast". Background: Youngest DD is heavily involved in re-enactment groups, notably mid-Victorian and Dicken's timeframe. She has a number of period dresses for those events. One that she attends every other month is a vintage dance, featuring Victorian dances ... Waltzes, Polkas, Schottisches, Mazurkas, and set dances such as the Sir Roger de Coverley and the Congress of Vienna. This dance is hosted by Ye Gaskell Occasional Dance Society, who has been doing these dances for the past 20 years. The pictures shown at their site are really horrid, as they are snapshots taken by various and sundry people, so they are mostly blurred and off center .. but you can get the flavor of the event. While most of the people who attend do wear period clothing, historic outfits are not required .... but if you don't, you still must be in formal attire. 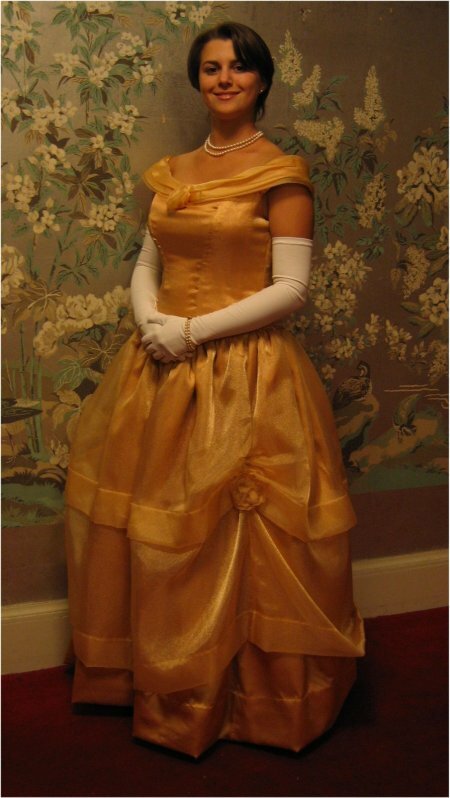 I used Simplicity 4269, which is a good enough imitation of Belle's gown. 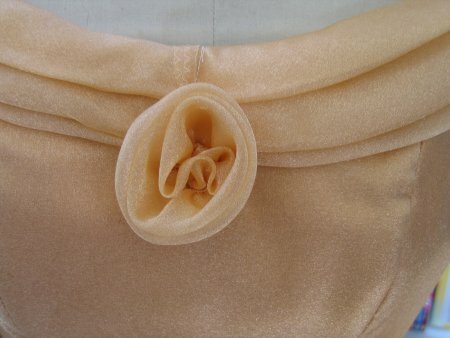 The base fabric is gold satin, overlaid with gold sparkle organza. The bodice is fully-lined and boned within an inch of it's life. I swear there must be 15 miles net ruffles in the petticoat. Truthfully, the dress can stand on it's own. 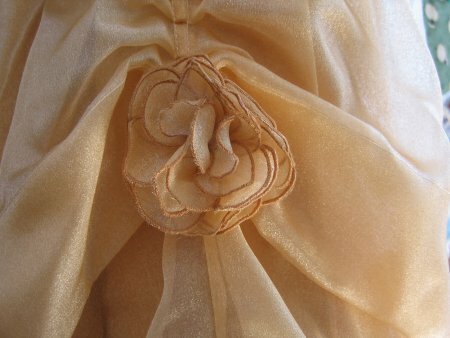 :-) The pattern called for self-fabric roses to adorn the gathered overskirt, but that was a bit too much for DD. She elected to have one self-fabric rose at the center front shoulder drape. However, I was able to find a machine-embroidery design to make 3 dimensional roses, which were then sewn to the front overskirt swag/drape. This is a freebie design, graciously offered by Stitch Delight. You'll need to scroll to the middle of the page where the new machine embroidery magazine, Flair, is shown. The 3D rose is a downloadable project there. Although the pattern didn't call for it, I put self-fabric piping in the seam between the skirt and the bodice. Not only is this a nice decorative touch, it actually strengthens the seam by providing more support. I also made an embroidered purse design (picture above) from , A Stitch A Half. 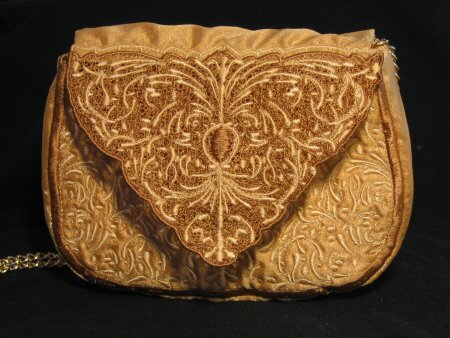 The picture at the top of this page is the front of the incredible Cameo Lace Clutch purse, which has a free-standing lace front flap. 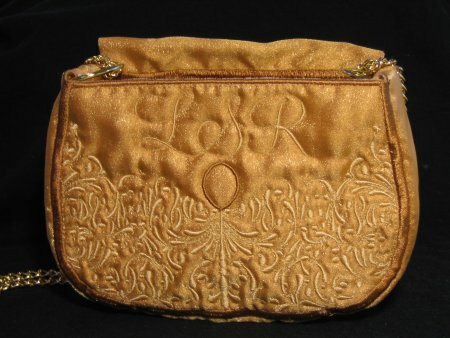 As a personalization, I stitched her initials on the front of the purse, in the area normally covered by the flap. The letters were once offered by SiCKDesigns, but I think it was from her yahoo group, as I can't find the alphabet on her website. 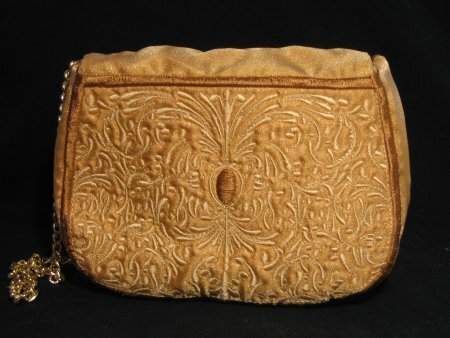 The back of the purse is also fully embroidered.